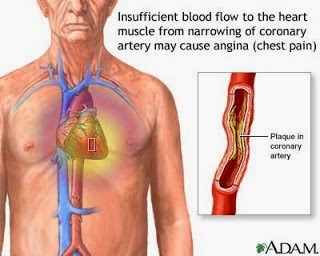 Angina is chest pain resulting from myocardial ischemia caused by inadequate myocardial blood and oxygen supply. Angina is caused by an imbalance between oxygen supply and demand. Causes include obstruction of coronary blood flow because of atherosclerosis, coronary artery spasm, and conditions increasing myocardial oxygen consumption. The goal of treatment is to provide relief of an acute attack, correct the imbalance between myocardial oxygen supply and demand, and prevent the progression of the disease ad further attacks to reduce the risk of MI. Stable angina also called exertional angina. Stable angina occurs with activities that involve exertion or emotional stress and is relieved with rest or nitroglycerin. Stable angina usually has a stable pattern of onset, duration, severity, and relieving factors. Unstable angina also is called preinfarction angina. Unstable angina occurs with an unpredictable degree of exertion or emotion and increases in occurrence, duration, and severity over time. Pain may not be relieved with nitroglycerin. Variant angina also is called Prinzmetal’s or vasospastic angina. Variant angina results from coronary artery spasm. Variant angina may occur at rest. Attacks may be associated with ST segment elevation noted on the electrocardiogram. 4. Intractable angina is a chronic, incapacitating angina that is unresponsive to interventions. Preinfarction angina is associated with acute coronary insufficiency. Preinfarction angina lasts longer than 15 minutes. Preinfarction angina is a symptom of worsening cardiac ischemia. 6. Postinfarction angina occurs after an MI, when residual ischemia may cause episodes of angina. a. Pain can develop slowly or quickly. b. Pain usually is described as mild or moderate. c. Substernal, crushing, squeezing, pain may occur. d. Pain may radiate to the shoulders, arms, jaw, neck, and back. e. Pain usually lasts less than 5 minutes, however, pain can last up to 15 to 20 minutes. f. Pain is relieved by nitroglycerin or rest. Electrocardiogram: Readings are normal during rest, with ST depression or elevation and/or T wave inversion during an episode of pain. Stress test: Chest pain or changes in the electrocardiogram or vital signs during testing may indicate ischemia. Cardiac enzymes and troponins: Findings are normal in angina. Cardiac catheterization: Catheterization provides a definitive diagnosis by providing information about the patency of the coronary arteries. The goals of medical management are to decrease the oxygen demands of the myocardium and to increase the oxygen supply through pharmacologic therapy and risk factor control. Frequently, therapy includes a combination of medicine and surgery. Surgically, the goals of management include revascularization of the blood supply to the myocardium. Percutaneous coronary endarterectomy to extract obstruction. Administer oxygen at 3 L/min by nasal cannula as prescribed. Administer nitroglycerin as prescribed to dilate the coronary arteries, reduce the oxygen requirements of the myocardium and relieve the chest pain. Instruct the client regarding the purpose of diagnostic medical and surgical procedures and the preprocedure and postprocedure expectations. Assist the client to identify angina precipitating events. Instruct the client to stop activity and rest if chest pain occurs and to take nitroglycerin as prescribed. Instruct the client to seek medical attention if pain persists. Instruct the client regarding prescribed medications. Provide diet instructions o the client, stressing that dietary changes are not temporary and must be maintained or life. Assist the client to identify risk factors that can be modified. Assist the client to set goals that will promote changes in lifestyle to reduce the impact of risk factors. Assist the client to identify barriers to compliance with therapeutic plan and to identify methods to overcome barriers. Provide community resources to the client regarding exercise, smoking reduction, and stress reduction. PREVENTION. Teach the patient factors that may precipitate anginal episodes and the appropriate measures to control episodes. Teach the patient the modifiable cardiovascular risk factors and ways to reduce them. Manage risk factors, including hypertension, diabetes mellitus, obesity, and hyperlipidemia. ACTIVITY. Each person has a different level of activity that will aggravate anginal symptoms. Most patients with stable angina can avoid symptoms during daily activities by reducing the speed of any activity. MEDICATIONS. 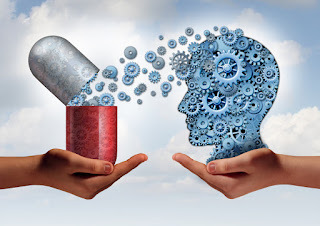 Be sure the patient understands all medications, including the dose, route, action, and adverse effects. If the patient’s physician prescribes sublingual nitroglycerin (NTG), instruct the patient to lie in semi-Fowler position and take up to three tablets 5 minutes apart to relieve chest discomfort. Instruct the patient that if relief is not obtained after ingestion of the three tablets, he or she should seek medical attention immediately. Remind the patient to check the expiration date on the NTG tablets and to replace the bottle, once it is opened, every 3 to 5 months. COMPLICATIONS. Teach the patient the importance of not denying or ignoring angina episodes and of reporting them to the healthcare provider immediately.